This lamp has 468 pieces and ranks 3 out of 5 in the difficulty scale. The difficulty factors are due to the grid layout of the pieces and the rounded shape of the form. 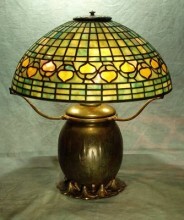 Odyssey Lamp Mold and Pattern for 16" Acorn Lamp: $136. Click the button below to add the 16" Acorn Lamp Kit to your wish list.